I finally read one of the Dork Diary books. My fourth grade book club chose #3, and I was compelled to comply. I have to say the kids love the series! So, I was willing to give it a go. I think it resembles a Disney sitcom. The main character, Nikki, has two best friends and an enemy MacKinsey. According to the group, and other kids I know, the books all start with Nikki doing something silly and MacKinsey finding out about it. This enemy has quite a bit of dirt on Nikki, including that she only attends their lovely private school because her father exchanges bug extermination for her tuition. MacKinsey spends a good bit of time working to keep Nikki down. In #3, Nikki is captured singing karaoke with her sister on film my MacKinsey. In order to avoid embarrassment, Nikki originally refrains from participating in the school wide talent show. The story unfolds from here and explores the common themes of friendship, determination, working to belong, and loyalty. If you are a reader or fan of the basic sitcom, you can guess the rest. So, would I suggest you get the book for your kid? I would if you have a non-reading girl. It is a great starting place. Once she is hooked on reading, you can push her toward some of the other great comedians on the page. You could start with Clementine and Zoe, chic geek, and move toward Pippi Longstocking. Every child needs a path into reading. If this format might appeal to your reader, definitely give it a try! I am currently enrolled in a class called The Historian's Craft. Among other things, we have to read a scholarly text and write a book review. In addition to reading the text, we had to find at least two other reviews of the book. What I discovered in reading through the many reviews of the book I chose is that everyone finds something different in the text. Every review differs in the way it identifies significant information, techniques and conclusions. I was given the opportunity to reread The Book Thief this month, when my seventh grade book club chose it for the October read. I must say that it was as original as I remembered, but different characters touched me. The first time I read the book, its protagonist Liesal demanded all of my attention. She is the focus of the book and the narrator, so this is no surprise. This time I fell in love with Max and Hans. In Liesal's life there are four significant men: her brother, Rudy, Max and Hans. Max is the Jewish man who hides in her basement and Hans is her foster papa, who invites Max to stay. The lessons of generosity and determination I learned from these men surprised me. Death, the narrator, comments at one point that he expects them to meet him standing up. Apparently, this happens when a person has regularly given of himself, making his soul light. If you want more details about the story jump over to my last review on this touching text. If you have read it before, give it another go, you will not be disappointed. John Grisham for Young Adults? Many "middle readers" have read the Theodore Boone books by John Grisham, but is his work suitable for the Young Adult reader? I tested﻿ this theory this month with my 8th grade book club. It is a small group. So small, in fact, that I can't divide them by genre. This fact forces us to get very clever with book selection. As a group we face the conflict between fantasy, non-fiction and realistic fiction. This month, I suggested we give John Grisham a try. My thinking was that the fantasy kids might like the adventure and suspense and those more interested in real life, true or not, might appreciate the plot. The kids were agreeable to the author and chose The Firm for a starting place. I was pleased with the choice because I had read it before and seen the movie years ago. I must admit, I told them I was not ready to read A Time to Kill with them. It is my own hiccup. I am just not ready to face that kind of hate with a group of kids. I downloaded the novel and listened, since it was technically a reread. The narrator didn't sound like I imagined Mitch sounding like (or was my view affected by Tom Cruises portrayals?). In any case, I was surprised by how much the book varied from the movie. For those of you who haven't read the book or seen the movie, it is a legal thriller. Young Mitch, a recent law school graduate, is lured to Memphis by the money and promise of a secure future at a small law firm. Before you know it, he finds his life invaded, not only by the firm, but by the mob and his past, as well. There are many twists and turns, making the novel fast paced and fun to read. 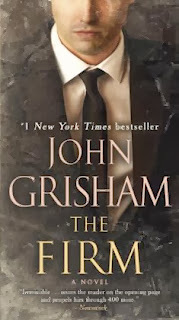 If your young adult likes the book, they should try the other legal thrillers by John Grisham. Some contain more adult themes, so you may want to supervise the selection. There are many, and they are a bit formulaic, but they are worth the time. I only pick the first book of the year for my book clubs. I choose the books by reviewing a list of questions I put on the registration forms. I ask the kids questions like, "what is your favorite movie? video game? book? and author?" After I review the questions, I group the kids by interest and age. I try to pick a book that I think will appeal to the genre of interest. Now, I have group of 6th graders starting their fourth year with me in book club. I have to say I would have told you I could pick a book for any of these kids. They usually love fantasy and adventure books. But, this month they took me by surprise. I have to say they are growing up. 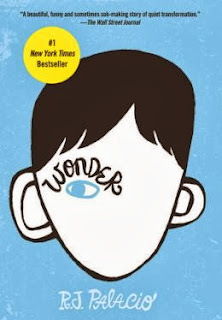 One of my most dedicated readers told the group that they just had to read Wonder by R.J. Palacio. He had read it four times and cried at the ending every time. He explained, " It is a book about a boy who is going to school for the first time in fifth grade. He had been homeschooled up to now because his face is terribly deformed. Going to school was hard for him, but it is a great story." This young man is very respected by the group, so they agreed to take on the novel. So, my fantasy kids are delving into realistic fiction with both feet. I am proud of the group and glad to have read the book. I have been tempted by the cover for the past year, but hadn't made the time to read the book until now. My young friend was right. This book is a must read. It is a classic coming of age novel with a cast of flawed characters. August, the main character, wears his flaws openly on his face. The others hide them more effectively, but they are revealed little by little to the reader as the story unfolds. If you have a middle school student, this book is a must read!